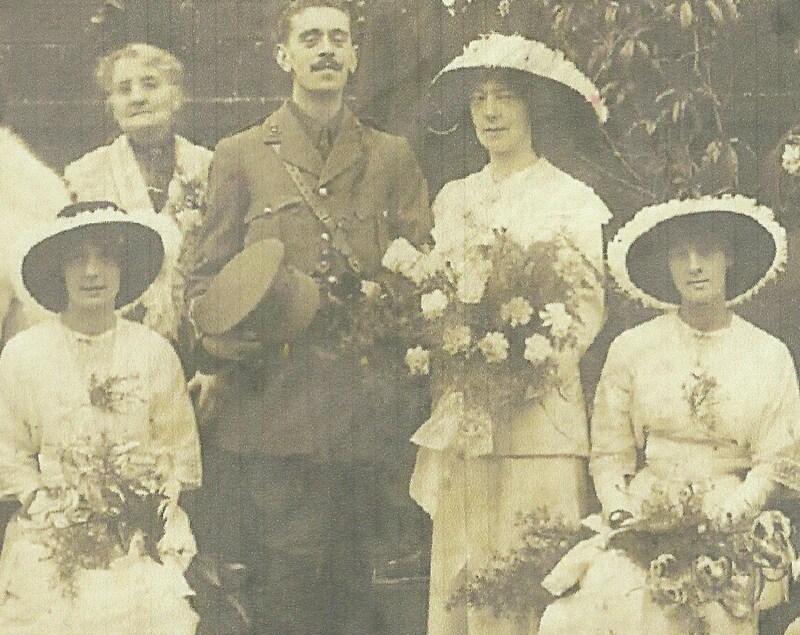 The wedding of Maud Beatrice Crocker to Arnold Carnegie Heron took place at the end of the Edwardian era on the 20th October 1914. 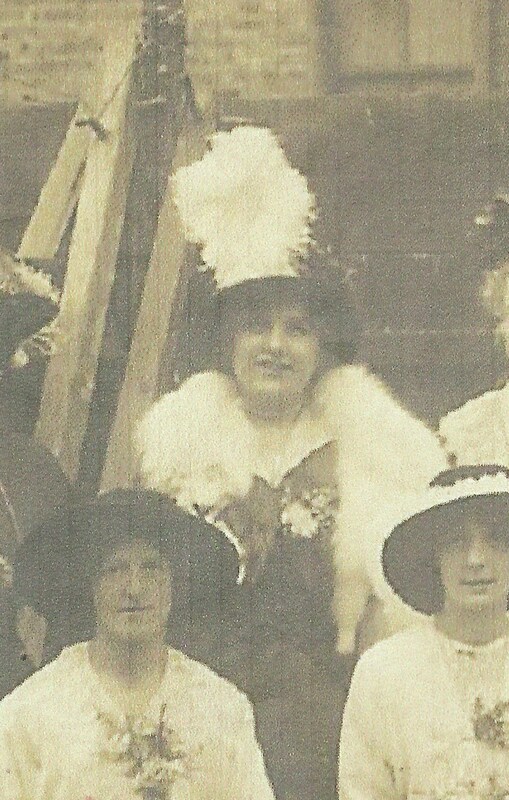 Maud was my 1st cousin 2x removed, her mother Charlotte was my great grandfather’s sister. 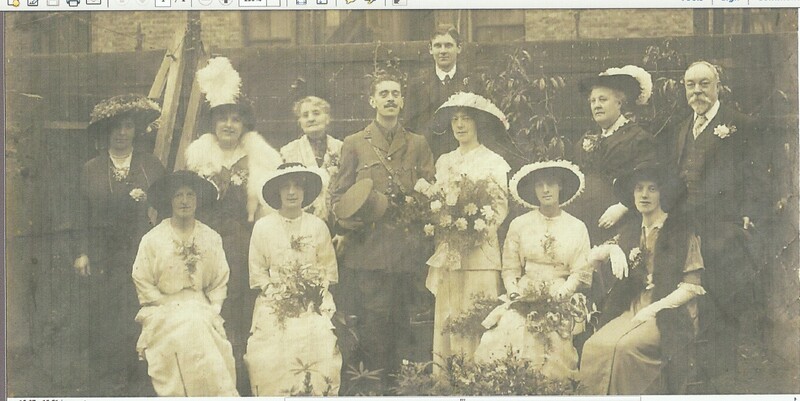 There were other weddings in the family during the Edwardian period, but this is the only photograph we have found so far. During this time it had become popular to be photographed outside, instead of the more formal studio images of the Victorian era. From looking at the dresses of the bride and her sisters (the four young ladies seated either side of Maud) it is apparent that the family were in a position to provide a formal white wedding with several attendants. The flowers and bridesmaids were now an established part of weddings, and the social status of a family could be assumed from the size of the wedding party, the location, setting, elegance of participants and the scale of the floral arrangements. Maud was holding a very large floral arrangement, the wedding was in October so I’m not sure what flowers they would have been, or what colour they were. Large, trailing bouquets were a characteristic of the Edwardian era. There is one very well dressed lady, to the left of the bridegroom. A wedding guest shows the fashion for sweeping feather trimmed hats and exotic stoles. Fashionable head wear for younger women was to wear wide-brimmed hats, which we can see the younger sisters of the bride chose to wear. 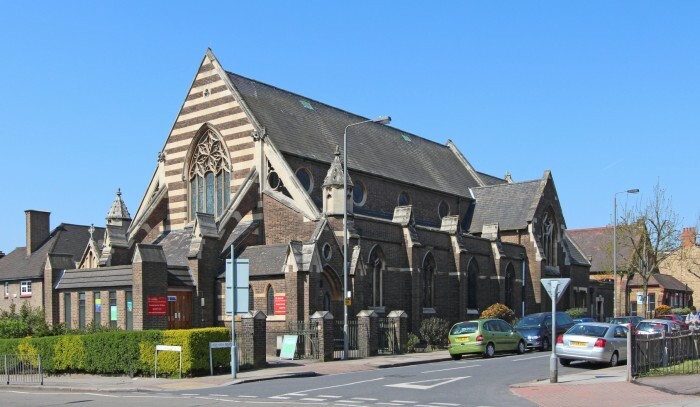 The church Maud and Arnold were married in was St. James, West Streatham. This church is still there, it was completed in 1910 with the chancel and spire added in 1914 – 15. Here is a photo, from their website. This entry was posted in Charlotte Harriet Dinnis, Churches and tagged Maud Beatrice Crocker, Samuel Richard Crocker, St James west Streatham, The Wykeham Studios, Wedding, wedding fashion, wedding flowers. Bookmark the permalink. I am glad to see you have found this photo, photos of the past are seldom found. I have been so lucky in finding old family photographs, I started off with so few and gradually I have found second/third cousins from all over the world who have been kind enough to scan and share the images. This wedding photo arrived a couple of weeks ago via Australia! That is amazing, I too am waiting for some photos from a second cousin I found a few months back, and thanks to her I found a whole line I never knew existed. FYI: I hope you don’t mind but that top photo you have up on your page, I downloaded and restoring it -it’s what I do. These are completely charming images, Jackie. Loved the post. Thank you Kate, I was so excited when some third cousins sent it to me recently! They only found me because of my on line presence, so I’m glad I’m here! You were wondering about the flowers. It is hard to say but I know that greenhouses and the greenhouse business were booming at that time. I come from a town where a family built acres of greenhouses beginning in the early 1900’s. I’m guessing they were rose. Oh, how interesting! It’s so good to be able to tap into your specialist knowledge, and thank you for sharing! I would never have thought they were roses because of the wedding being in October! I’m rubbish at gardening and had no idea roses could be grown in greenhouses! Thank you for that! And it opens up a whole new world for me also, of ‘flowers in my ancestors times’.